I would say that I spent about fifty percent of my time at this festival waiting on line. For coffee, for food, for films, for parties, for rides, everything. Even as a first-timer, I knew this was due to growing pains. The staff and volunteers were trying their valiant best to accommodate the floods of people at their festival, and I mean floods. I almost fainted when I saw the line at registration which was about a mile long. In her intros to films, festival producer, Janet Pierson, after the event had kicked off in earnest, took to asking audiences if people were having trouble getting into films. After hearing a resounding yes!, she courteously suggested people make an alternate plan and to really make space for line-standing time into their schedules. Not all of the cinemas suffered from this glut, but the smaller main venues certainly did. "A good problem to have," as Pierson said, but hard going when one is trying to see as many films as possible every day. After desperate suggestions from guests that have been attending for a while to provide a shuttle service (which they charged for), there were only two vans making the main loop, which meant waits of up to 30-45 minutes to get to another spot in town. The only other option was a taxi ride and a few of those a day really add up and make your pocketbook empty out pretty damn fast. Anyway, enough bitching, it was fun and fabulous and a great new experience. With enough sunshine, margaritas, great Tex Mex food, loads of parties, friendly, hospitable Austin-ites, music pouring out of every orifice on 6th Street, and lots of lovely programming comrades on tap, it wasn't half bad. I'm sure they'll be better prepared for next year and I hope they get the same kinds of crowds they did this year. It was heart-warming, I tell you, to see lines snaking around the corner for films nobody knew anything about except from a description in a catalog or on the web site. A personal thanks to new programmer, Jim Kolmar, (also film conference coordinator and web content), a man with great taste, for including The Living Room of the Nation in the SX Global section for its North American premiere. Futurestates: ITVS commissioned eleven filmmakers to make short narrative films that examine current events by extrapolating them into the future. SXSW world premiered six of them, including films by Greg Pak, Garret Williams, Ramin Bahrani, Tze Chun, Aldo Velasco and Annie Howell. Standouts were Bahrani's Plastic Bag with Werner Herzog as the rapturous, yet ultimately disenchanted, title hero; Tze Chun's Silver Sling about a struggling career surrogate--a woman who is hired to produce babies for high-ranking female workers of a corporation--who has to decide to give away yet another child or keep it, her last chance at motherhood; and Annie Howell's Tio & Marco, about a pregnant border patrol agent who finds an illegal immigrant child hiding in her house. See more Season 1 selections here. Tiny Furniture: This was the only film I manged to see in the narrative competition of eight films. It also walked away with the jury prize at Tuesday night's ceremonies. As well, its creator was bestowed with Chicken & Egg Pictures' Emergent Narrative Director award. There is no doubt that 23-year-old filmmaker, Lena Dunham (fellow Hammer to Nail contributing writer) has a very bright future. This accomplished feature which Dunham wrote, directed and stars in, had one of those crazy lines where not one pass holder got in since the badge holder line was so long. Meaning the audience consisted mostly of industry supporters and friends, so there was a lot of excitement. The story is about the recently college-graduated, heartbroken and very confused Aura, played by Dunham, returning to the nest and trying valiantly to live comfortably in the (very antiseptic) family homestead, a giant loft in Tribeca peopled only by her mother, Siri (played by Dunham's real mom, renowned photographer, Laurie Simmons in a fine performance) and her sister, Nadine (played by Dunham's real sibling, Grace). Taking a dead-end job as a day hostess in a small restaurant around the corner from where she lives, she meets and courts two ne'er do wells, Jed (played by filmmaker, Alex Karpovsky in a sly, subtle performance) who moves into her house and refuses to touch her, and Keith (David Call who gives a superb and, oddly, endearing performance) who fucks her in a huge pipe in a playground. Dunham creates precocious characters who interact with one another in that numb, detached way people do when all, to a person, are disaffected and lost in some way, their own pain or preoccupations making them only partway "there" for their loved ones. Or they live a life completely in an alternate universe, like that of her "best friend" since childhood, Charlotte, played by the luminously beautiful and very quirky, Jemima Kirke, in the film's most charming performance. Dunham has the writing chops for good television and the film has a patina that isn't really conducive to dark and depressing themes. This left me somewhat emotionally detached, but perhaps I could also say that this is possibly the film's strongest point. Like Woody Allen, she can easily find humor in painful angst and presents her plump, misshapen body and hangdog expression to great affect. The scene where she sits on a deflating mattress staring off into the middle distance says it all. You do want to cuddle her and tell her everything will be all right. But you also want to slap her pretty hard. Jody Lee Lipes steps in as DP and does his usual glorious work--he shot the whole film on a still camera. This might be one of those festival breakout films that will do decent box office given the right marketing spin. I just hope it doesn't take a bloody year or more--get it out in theaters this summer would be my recommendation. It's a great seasonal film and millions of graduating college seniors will find the movie that speaks directly to them. More from SXSW in a bit. There will be five parties that will feature the best of Rooftop's programming and will probably prove to be a key networking spot to boot. Each evening will begin with your $40 admission price (all tax deductible, BTW) for a full cookout and all the Radeberger beer you can drink. (Well, maybe half of what you can drink.) There will be a screening and a chance to mingle with Rooftop staff and featured filmmakers in an intimate setting, Tad's terrace in Williamsburg. The 9:00 p.m. Saturday night parties will be on September 26 (Benh Zeitlin's exquisite Glory at Sea will play); October 10 (Michael Palmieri and Donal Mosher will show excerpts from October Country, their award-winning feature doc); October 24 (Yoni Brook and Musa Syeed's highly-entertaining Bronx Princess will play); November 11 (Jesse Epstein's 34 x 25 x 36, the latest short work in her body image series will be featured); and November 21 (Carlin by Brent Green; the screening will include a live musical performance by Green). Click here to choose a date and buy your tickets in advance. This Tuesday evening, September 1st, I and Nancy Wong of 011 Design Collective, will be hosting a small fundraising benefit for a project called Up and Coming at DCTV. The evening will begin at 7:00 p.m. with cocktails, music and schmoozing, and then at 7:45 p.m., we will be showing the first 10-minute installment of this multi-part, multimedia project followed by a Q&A with director, Eliane Lazzaris, and artists Priscila De Carvalho (pictured working in her studio) and Lina Puerta. Following the Q&A, author Charlotte Noruzi will discuss her design collaboration with Eliane Lazzaris on her book, Urban Iran, profiles and perspectives of independent Iranian artists. There will be signed copies of the book available for purchase. The event is a benefit to raise funds for a new microphone and for production costs on the next installment of the series, featuring Puerta. Up and Coming features film portraits of emerging female immigrant artists living and working in NYC today. Each artist will tell her own story in a stand-alone segment that will focus on the strategies she has found to continue to seek to define her cultural and artistic identity in her adopted country. Lazzaris is a multimedia artist residing in Long Island City, Queens. She came to New York from her native Brazil in 2004. Her book and design credits include projects for DCTV, the Inaugural Cinema Eye Honors (2008), Urban Iran and Translating Hollywood, a book by Sam Sarowitz on movie posters. This project is her film directorial début. Lazzaris says that, "The art world continues to be dominated by men and immigrant rights continue to be debated in Congress, so I devoted this project exclusively to female immigrant artists as an opportunity to further recognize our important artistic and cultural contributions. "The idea for the project began shortly after I arrived in New York in '04 when I realized the difficulties I would face, as both an immigrant and as a woman, as I continued my commitment to sustaining an artistic practice in my life. Looking for support and inspiration, I became increasingly involved with other immigrant artists. "This documentary series presents film portraits of female artists from around the world as they face the challenges of uprooting themselves from their home countries and relocating to the US. To document their lives and work, I will follow each individual for a period of about eight months, focusing on the strategies they adopt as they seek to define their cultural and artistic identities on their own terms. Each artist will be featured separately in an individual video. "I plan to further expand on the perspectives provided in the film series through a companion book project that will explore new directions in the material and offer more in-depth bios of the artists." Please join us Tuesday evening to meet the director and the artists. We are asking for a suggested donation at the door of just $10 and there will be other opportunities to offer support throughout the evening with a raffle of items donated by some generous sponsors. DCTV is at 87 Lafayette Street in Tribeca; we'll be in the big back room on the ground floor. You can RSVP and/or send donations to eliane@nadela.org. Hope to see you there! The Boston Globe called director Aaron Woolf's King Corn "a moral, socio-economic odyssey through the American food system." This very entertaining and eye-opening doc feature has its DVD release tomorrow. We follow best friends (and the film's co-producers), Ian Cheney and Curt Ellis, as they move to the heartland of the US to learn where their food comes from. 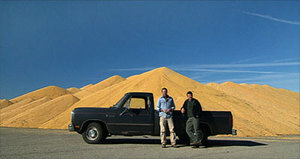 They plant and grow a huge crop of corn on just one acre using genetically modified seeds and strong herbicides. As they track their product through the food system--traveling through 30 states and Mexico--what they find raises important questions about how we eat and about how we farm. Last year, the film had its domestic premiere at South by Southwest and its international one at Hot Docs one month later. Last September, they had a theatrical release in New York at the Cinema Village and this month the film had its broadcast premiere on PBS' Independent Lens. King Corn is also programmed into the current season of the Sundance Channel's The Green as one of thirteen featured docs. Click here to order your very own copy. Eric Hilton of Thievery Corporation has a beautiful new restaurant/lounge dedicated to Marvin Gaye in the heart of DC. My friend, Brian Liu, and his partner, Nick Pimentel were commissioned by Hilton to design something spectacular for the restaurant's centerpiece. Here's a time-lapse film documenting the installation of their 6' x 10' masterpiece. Check it out. My friend, Sarah Feinbloom (yep, that's her pictured at left), makes pretty hard-hitting, intense documentaries and lots of fundraising videos for good causes. Based in the Bay Area of California for many years, Sarah's been a long-time member of the distribution collective, New Day Films. Her film on the religious lives of teenagers, What Do You Believe?, screened on PBS, and her beautiful piece on child trafficking in Thailand, Daughters and Sons, was featured on NPR. It also won for Best Short Film on Child Advocacy at the 3rd Annual Artivist Awards, which I produced in the fall of '06 at the Egyptian Theater in Hollywood. Shortly after that, Sarah told me that she was working on something a little more light-hearted (and delicious!) and that her work-in-progress film, In Search of the Heart of Chocolate, would be more of a sensually-conscious journey rather than the socially-conscious fare that is her normal bent. It centers around her search for the origins of her chocolate obsession. On February 12th, a couple of days before that day where everyone's supposed to do something romantic for his or her sweetie--like buying chocolate!, there will be two screenings at the Delancey Street Screening Room at 600 Embarcadero in San Francisco. This "chocumentary" features Bay Area chocolatier, Jack Epstein, who runs Chocolate Covered in Noe Valley, and some of his die-hard chocoholic customers, all consumed by the discovery of the perfect chocolate experience. An all-chocolate reception will follow the later screening. I saw an earlier cut of this and it is, indeed, quite a treat! If you live in the area, or are planning a romantic weekend in the city by the bay, you can reserve a spot by emailing info@chocumentary.com. Wanna Go to a Really GOOD Party? GOOD Magazine is one year old! And they're celebrating their anniversary by having a series of parties in various cities, New York being one of them, natch. Join in the celebration on Saturday night, September 29 from 7:00 p.m. to 3:00 a.m. The party is being held at the beautiful Smithsonian National Museum of the American Indian. Performances by Jeremy Greenspan of Junior Boys, A.D.J. (Aaron, Didi & Jesse of the Brazilian Girls), Tim Sweeney of Beats in Space/DFA and Sam Valenti IV of Ghostly International. You can RSVP here. The event is for subscribers only. So subscribe! It's a great mag filled with tons of useful and inspiring information on how to be a better citizen in your neighborhood, in your community, in your city, in your country, on your planet. GOOD's anniversary party in L.A. (on the eastside) is happening on October 12 at the Natural History Museum.